Most curlies and coilies love the versatility of their natural tresses. Sleek chignons, voluminous twist outs, and bold Bantu knots are just a few of the vast styling options that can be easily achieved on textured hair. Some curlies also like to wear it straight, but sporting this look can be detrimental if done too frequently or achieved improperly. 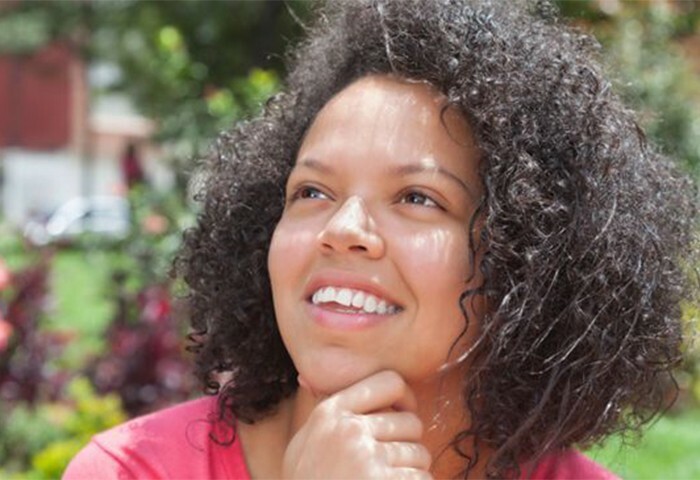 Recently, NaturallyCurly community member priyankaa inquired about heat damage in our Q&A section. I have severe heat damage, should I big chop or transition for a while ? I should also add that I am in college and where I go to school there isn't and hair stylist near by. So I am left to deal with my hair myself. I highly encourage cutting the heat damaged ends. If you are not comfortable cutting your own hair, then I strongly suggest scheduling an appointment with a stylist or save money and schedule time during the school year. Anytime the hair is damaged, whether it is chemical or mechanical, it cannot be reversed. Whenever you see products with advertising claims to remedy split ends, the products formulated with PEC technology are only meant to temporarily fuse the split ends together. When the hair is damaged and the ends are not trimmed, there is an extremely high potential for that damage to travel up the hair shaft. Coming from the experience of working in a salon, I have witnessed women long-term transition with relaxed and heat damaged hair and have to cut more than they expected because the damage traveled beyond the point of demarcation. In my opinion, you can either cut now or potentially cut more than you expect later, which defeats the purpose of transitioning. You do not want to fry product buildup, debris, oil, and dirt on your hair. Clarifying your hair is important for the straightening process, so make sure to use your clarifying or moisturizing shampoo to start the process off right! Yes, these do exist. For protein sensitive curlies their hair tends to become dry and hard after using a protein treatment, but this can also be a result of how strong the protein treatment is. By using it before heat styling you are helping to strengthen the hair for the process, and using it afterward will rejuvenate your curls. Check out the Top Protein Rich Conditioners. There is no proven number of times that guarantees heat damage will occur, but based on my observation most curlies and coilies try to keep it to a three to four times a year, if that. Yes, we all know the anomalies that straighten every week and can rock a wash and go with curls intact, but that is not everyone and I do not encourage you to find out. The lower the temperature, the less likely the hair is to experience damage. Usually the rule of thumb is the thicker the strands, the higher the temperature. Most curlies try to stay under 350 degrees or 375 degrees. It may be challenging to achieve the fresh-relaxed look but at least you are not compromising the health of your hair. Although a lot of curlies and coilies are anti-silicones, this is the time to load up! Silicones will not only reduce the potential of damage from the direct heat of the plates, but they will also help to reduce the amount of moisture in the air from penetrating the hair shaft and reverting your curls. You want to apply the heat protectant while the hair is damp and before the blow-dry process in order to seal in moisture. Check out the Top 15 Curly Hair Serums. Typically before straightening people use a blow-dryer but lately many naturals have been using the banding method. If you do opt for a blow-dryer, try the tension method. If you opt to use the tension method or blow-dryer with comb attachment to stretch your hair prior to straightening, make sure the hair is damp and not wet. Blow-drying wet hair is equivalent to frying the hair, which is very harsh on the hair. YouTube is full of roller set and roller wrap tutorials if you want to learn how to straighten your hair without heat. Again, you may not have the same finish as your would with a flat iron but there are healthier option. What is your straightening regimen? How do you prevent heat damage?